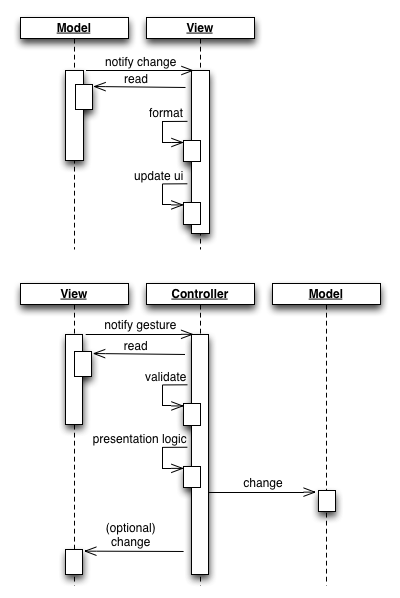 People who make computer systems including a User Interface (UI) often refer to the Model View Controller (MVC) pattern to drive their design. MVC is actually a mainstream pattern of fundamental importance. But there are lots of misunderstandings about MVC and some improved patterns have been proposed to address some problems of the original MVC, which by the way is rather old. Ensure that any code that manipulates presentation only manipulates presentation, pushing all domain and data source logic into clearly separated areas of the program. ... The idea behind Separated Presentation is to make a clear division between domain objects that model our perception of the real world, and presentation objects that are the GUI elements we see on the screen. Domain objects should be completely self contained and work without reference to the presentation, they should also be able to support multiple presentations, possibly simultaneously. The Model. This participant is usually part of the domain model and is made of one or more domain abstractions (e.g. a list of Person objects). It might be connected to a persistence facility (e.g. a relational database) and allow concurrent modification by means of transactions, but this is not relevant in the MVC perspective; actually the Model can be designed in many different ways. What's important is that it contains domain objects and exposes functions to manipulate them. This participant is completely ignorant of the UI - it even doesn't know what a UI is. The View. This participant is the one that actually realizes the UI, so we can imagine it's made with a UI-specific technology, such as Swing, Android or Vaadin. It knows about the widget layout on the screen, the way widgets interact with the user, it can change their state as well as listen to user gestures made by means of the mouse, the keyboard, the touch screen or other input peripherals. The Controller. This participant provides the “intelligence” of the UI, as it receives notifications by the View about user gestures and interprets them as requests to trigger business logics that manipulate the model or to change the View itself (e.g. by rendering a new screen, web page and so on). We can refer to this set of responsibilities as “presentation logic”. The View observes the Model and whenever the latter changes it pulls the new pieces of data to update the UI. The Controller observes the View and whenever the user does something it reacts appropriately. Since design patterns in the real world are seldom found in a “pure“ way, there can be many legitimate variations on the basic theme. On the other hand MVC is probably one of the most misused terms in computer engineering: many people use the term just to mean Separated Presentation, that is a “good” design of a UI, but they aren't actually using MVC. What's the Model? In many simple examples this participant is directly implemented by a Domain Abstraction class. This could be ok with some categories of applications, for instance monolithic desktop applications. If the application connects to a remote server, it's likely that the Model is an adapter to the real Domain Abstraction (for instance by means of a remoting proxy), or a local copy of it (for instance by means of a Data Transfer Object (DTO)). Many popular UI frameworks that are considered by many to be MVC, aren't properly MVC. For instance, Swing architecture is “loosely based on the traditional MVC design” (quote from the original Sun paper), but it departs significantly from MVC for some details. It's true that many of them are related to some inner parts that aren't necessarily interesting for the developer: for instance, the relationship between components and “UI delegates” can safely be ignored if you aren't developing a look & feel. Ignoring these parts and looking at the technology only with the perspective of the integration with a back end, the MVC characterization can be still good. A more relevant point is that most UI frameworks provide their specific “intermediate” models at least for the most complex components: think for instance of Swing javax.swing.table.TableModel, Android android.widget.Adapter and Vaadin com.vaadin.data.Container. These are adapters that “translate” data in a way that can be directly consumed by the UI components. This concept, which is pretty useful, is called “Presenter” by a variation of MVC called Model View Presenter (MVP). How is the notification facility implemented? 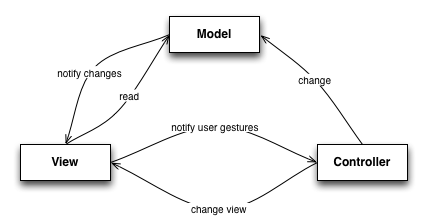 In the diagram we supposed to have a simple event notification mechanism without attributes, so the View later reads the Model; but it could be possible to avoid that further step by augmenting the notification with an object describing the changes. These are minor details, anyway. Also, in this area a technique that has got some popularity is data binding (BeansBinding is an example in the Java ecosystem): by means of language feature or a specific library, it allows to logically bind properties in two different objects, so when one changes in the former object another is changed in the latter. Data Binding can be pretty useful with forms, as it reduces the complexity of implementing the data item exchange with the View. Think of a form with dozens of items: instead of exposing getter and setter methods for each one, you just need one getter and one setter for an object containing all the items as bindable properties. Which is (or should be) the most valuable part of our design? Which is (or should be) the least valuable part? Where should we spend more resources for automated testing? The most valuable parts of the design are the Model and the Controller. The former is part of the Domain Model, which is the core of our project, and it has got a strict relationship with data and business rules, which usually are the most stable and valuable portions of a software application. The latter implements the presentation logic and it's responsible for doing the right things on behalf of the user itself. The least valuable part of the design should be the View. UI technologies are very volatile (I'd also say fashionable) and very depending on the context. If we don't have specific deployment issues (it happens for instance where deployment is supervised in some way) we can realize a full fledged desktop application by using Swing, JavaFX 2, the NetBeans or the Eclipse Platforms. If we have deployment issues it's better to go with a web application, for instance made with Vaadin. If we want to run on mobile appliances, we could pick Android. Why am I mentioning Vaadin as a web technology example? For this blog post I'm keeping quite generic about UI technologies, just stressing the fact that I want a design that doesn't depend on them. But in practice I know that it works with the class of UI technologies that support “push updates”, that is UI changes that are performed in reaction to a stimulus originating from the server. Most of the technologies that are not web based support them, but the traditional web frameworks don't since they restrain updates within the “pull” approach typical of a HTTP request/response. Fortunately, modern frameworks for Rich Internet Applications support push updates by means of AJAX. Vaadin is one of them; it's not the only one, but one that I have a good experience of. All these technologies have their own libraries for creating a UI, so an hypothetical application that must be deployed to multiple channels (e.g. Web and Android), or that during its life must be ported from an environment to the other, should be able to change its View implementation with the minimal effort and without touching the Model and the Controller. Formatting. The View directly accesses the Model, that we can call “raw data”. For instance, a date could be represented by a java.util.Date, but almost for sure we want it to be rendered in a human readable way, often localized. This behaviour wouldn't change whether we have a desktop, a web or a mobile application, so if it is implemented in the View we are going to lose it when that specific View implementation goes away - and re-implement it in the new View. Some presentation logic in the View. The View very often has got some portions of presentation logic. For instance, our requirements could mandate that a measure readout in a gauge is rendered in different colours in function of the value (e.g. normal values are green, alert values are in flashing red). While different UI technologies require different code - changing colour in Swing, Vaadin or Android is made by calling different methods - a common mistake is to put the decision about which colour to use in the View rather than in the Controller, perhaps also because the UI technology offers some support for this operation. As for the previous point: change the View and the implementation goes away. UI behaviour consistency. When MVC was defined most of UIs were just made of forms for data entry and a full application could be thought as a sequence of forms coordinated by a flow controller. Most of the View behaviour was filling form fields, picking menu items and pressing buttons. Today we have much richer ways of interaction, for instance contextual menus and reaction to click, swipe, pinch, etc... and furthermore we want consistency throughout the whole application: that is, a gauge representing a temperature in different parts of the application should always offer the same contextual menu and react in the same way to click, swipe, pinch, etc... (note that we're talking of a simple widget representing a single piece of data, not a whole View, thus decomposing Views doesn't help here). The typical way to cope with this requirement is to develop specific widgets for specific data types, for instance a TemperatureWidget, but since widgets are technology dependent this ends up in making a SwingTemperatureWidget, a VaadinTemperatureWidget and an AndroidTemperatureWidget. This ends up with further presentation logic in the View implementation that will be lost when that implementation goes away. Lack of flexibility in data binding. If you like data binding, there are high chances that you experience some frustration when you move off simple cases. In MVC, binding can only occur between M and V. But this also means that the binding framework must provide support for formatting and formal validation (BeansBinding happened to do that, but this is not always the case). And what about derived or split properties? For instance, a single item in the Model could be represented by separate form items in the View (e.g. a phone number could be split into a prefix and the proper number). Usually these issues are addressed with further presentation logic in the View... and at this point you know the rest of the history (if instead you're thinking of binding the view with something else than the Model you're probably on the right track, but this is not MVC any longer... read below). Testing. We didn't answer the previous question about where to spend more resources for automated testing. The answer is obvious: in every place where there's some valuable behaviour. Given the previous points, with MVC we have application-specific behaviour in the View, not only in the Controller, so we must test both (the Model of course is always tested on its own). Since the View depends on the technology, its testing depends too: so we have to use specific Swing, Vaadin and Android testing frameworks. Change UI technology... and you have to rewrite all the tests for your View. For what concerns testing, there's an additional point. Even if you ignore the problem of switching the UI technology, automatic testing of a UI can be complex. There are many products that allow to do things such as recording user gestures, playing them back against a UI and asserting postconditions (Selenium being one of the popular ones in the web world), but after some initial enthusiasm I find that they are too much expensive to use and to maintain. I had a better experience with Swing automated testing, but now I think that a cheaper, alternate way of testing a UI must be found. What we really need is a dumb View, really focused only on the graphic responsibilities. This is where Presentation Abstraction Control (PAC) can help. The Abstraction. It plays the same role of the Model in MVC, so there are no further comments. The Presentation. It's the dumb View we were searching for. The Control. It plays an enriched role of the Controller in MVC. A good general guideline for evaluating a design is the presence or lack of symmetry. Generally speaking, symmetry is a plus. An asymmetry means that one task and its opposite, or its complementary, are performed in a different way. Unless there's a specific reason, this is just unjustified complexity, to be eliminated to comply with the Occam's razor. Compare the sequence diagrams for MVC and PAC: while PAC is symmetric (both interactions originating from the View and from the Abstraction linearly involve all the three participants), MVC is not (interactions originating from the Model don't involve the Controller). As promised, no logics in the Presentation. Just get incoming data and render them in the proper place. All the other mentioned problems can be solved in a similar way: for instance, decide which colour to use in the Control and then call Presentation methods such as renderTemperature (int value, Color color). Imagine that an implementation for Vaadin or Android wouldn't be much different. In the original description of PAC there's much more than this. For instance the pattern is defined in terms of agents and in general there's a better guidance to decomposing complex UIs. All interesting stuff that I'm ignoring in the scope of this post, but that I will pick in future. On these premises, since the Presentation is dumb (no logics), there's less value in testing it. The whole set of user-UI interactions now stays in the Control, so it can be tested by mocking both the Presentation and the Abstraction with one of your regular Java tools such as JUnit, TestNG and Mockito. It also means that you can design in TDD (Test Driven Design) if you wish. More sophisticated testing can include integration tests where you have almost the whole application (I mean, the Abstraction is the real back end, not mocked), while the Presentation is still mocked. I've never seen applications deployed to production after only automated tests were passed, without a final supervision by means of a human tester. There are some aspects, such as the visual quality of the rendering, that are very hard, if not impossible, to automatically test: for instance, how can you test whether a text is rendering on a background with insufficient contrast? Or whether a font is too small to be read, or too large to render the whole contents in a text box? These are things to be tested by the human eye. The important thing with human testing it's that it's expensive and must be reduced to the minimum. The responsibility of the Presentation is so simple that it's less probable to make mistakes and they are restricted to very simple ones. I mean: with a MVC View, it could happen that you rendered the wrong data because of failing presentation logic. With a PAC Presentation, either you don't see data rendered (because you forgot to call that setText()), or they are correct (because they have been prepared by the Control). In a similar fashion, in a View pressing a button could trigger the wrong behaviour; with a Presentation either the button does nothing or it does the right thing (because it's fully implemented by the Control). Of course “less probable” doesn't mean ”impossible”: but given that you have to perform some human-based testing anyway, the human tester can also easily spot the trivial errors that we are talking about. The added cost of to perform this task is negligible. If you still want some form of automated test for your Presentation, you can consider using a specific UI technology framework exercising not the whole application, but each single Presentation in isolation with a mocked Control. The details about testing will be more clear when I'll introduce some real-world code in a further post. Summing up, PAC solved some problems, with the exception of two: the UI behaviour consistency and the lack of flexibility of the data binding. That's what the Presentation Model is for. Represent the state and behavior of the presentation independently of the GUI controls used in the interface. ... Presentation Model pulls the state and behavior of the view out into a model class that is part of the presentation. The Presentation Model coordinates with the domain layer and provides an interface to the view that minimizes decision making in the view. The view either stores all its state in the Presentation Model or synchonizes its state with Presentation Model frequently. ... A view then simply projects the state of the presentation model onto the glass. 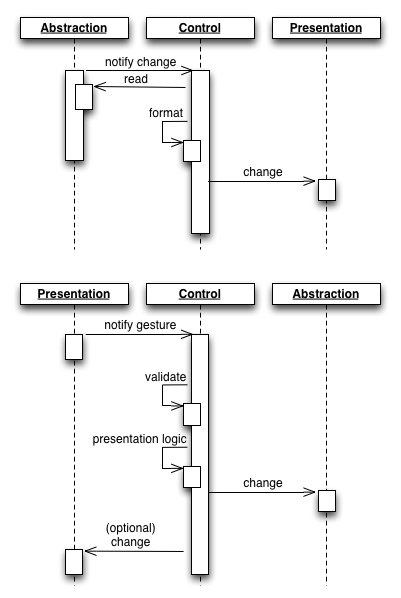 In other words, the Presentation Model is a sort of intermediate object between the Presentation and the Abstraction. It doesn't have any knowledge of specific UI widgets, but provides the models that can be bound to them. For instance, an Abstraction can represent a Person in a registry with the name, the job description and a photo. Its Presentation Model could provide a short description (e.g. name + job) to be rendered in a list row, transform the photo into a small icon to be rendered near the description, and provide callbacks for the click and double click gestures, as well as an enumeration of further callbacks that could be rendered in a contextual menu. 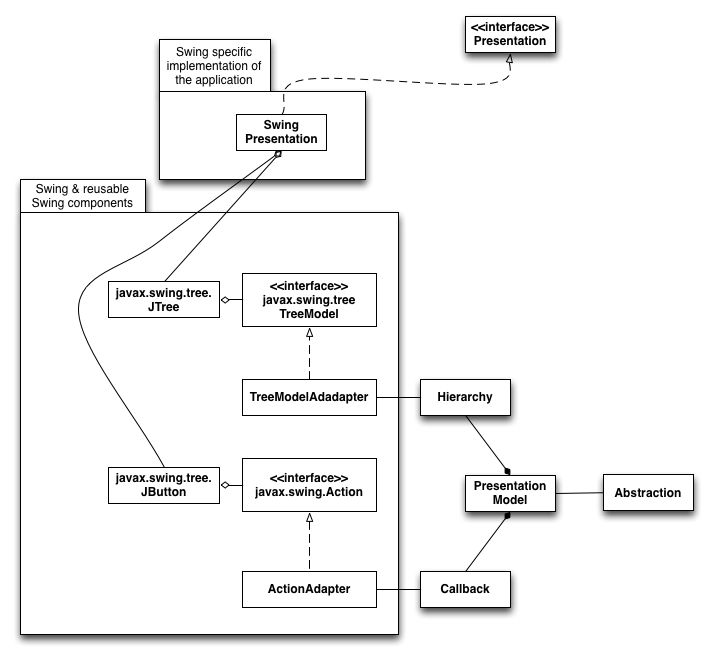 The Presentation Model is a very similar concept to the Presenter in the previously cited Model View Presenter pattern. It's a responsibility of the Control to instantiate and properly prepare a Presentation Model for an Abstraction. The Control would never directly expose an Abstraction to the Presentation to ask for it to be rendered; in its place it would pass the Presentation Model for it. In other words, we can say that the Presentation would never see and access a “naked” Abstraction, but only operate on it by means of its Presentation Model. Thus, the Presentation Model works as an Adapter of the Abstraction for the Presentation. By creating the same Presentation Model for a given Abstraction and reusing it for all the PAC instances in our application we are making sure that the UI will always behave in a consistent way. The Presentation Model can also provide a solution for flexible data binding: instead of binding the Presentation to the Abstraction, you can bind it to the Presentation Model. It can expose a mix of the original Abstraction properties and derived ones (such as the description defined as name + job in the previous example). A real world example of how a Presentation Model interacts with a Presentation for a project made with Swing. Entities outside the packages are not depending on any UI technology; entities in the “Swing & reusable ..." package are reusable for all applications based on the Swing technology. Similar diagrams for Vaadin or Android could be drawn by just replacing the specific classes. Sometimes it's advisable the opposite approach because some UI technology could already provide existing classes that are already a good Presentation Model or a good basis for it. The NetBeans Platform, for instance, offers a org.openide.node.Node class which is an excellent support, performing a number of integration tasks with the rest of the Platform. It could be expensive to rewrite that features. With the NetBeans Platform my approach is to use a Presentation Model implementation that inherits from Node. Both approaches can be made to co-exist by referring to a Presentation Model by means of an interface (or abstract class) and using a Factory pattern which returns the most appropriate implementation. There's a trade off to apply here and often you have to give up to something. Most UI frameworks, or add-on libraries for them, offer specific support for common tasks: for instance, think of a table model that is associated to a SQL query, capable of self-populating and perhaps even in lazy mode (by just querying the minimum set of data to fill the page). In other cases, such as in Vaadin, you have specific APIs for building an Abstraction upon them. By using those features the UI framework will let you create a working application in minutes - a faster approach, definitely. My take is that you should give up to that (unless you are just doing a quick prototype): what you gain in the short term will show an additional cost in the medium and long term. My experience is that with the proper design it's not hard to develop a small set of classes that offer the same features in a UI technology neutral fashion. Of course, only you can make the correct evaluation, case by case. PAC and Presentation Model, when properly implemented, can solve all the MVC issues that we've mentioned. But we can further improve our design to add some flexibility. For instance, for what concerns UI consistency, we assumed that a given Abstraction must be rendered always in the very same way throughout the UI. But sometimes there are exceptions: for instance, in some cases we'd like to prevent a contextual menu from appearing, in other cases we'd like to add or remove some menu item. Or we could need slightly different behaviours of the same PAC reused in two different applications. The most immediate solution is to implement alternate Presentation Models. But there's a better approach that delivers this flexibility without a proliferation of Presentation Models - indeed, we could even have only one single Presentation Model for everything! The Datum is a stateful class only representing plain data with a very simple behaviour (the one which does not involve interactions with other objects). For instance, in the classic BankAccount example, there would not be a transfer() method (this requires another BankAccount, or another source or target), but a withdraw() or a deposit() (that is, the “partial” operations that are seen by a single instance of Datum). 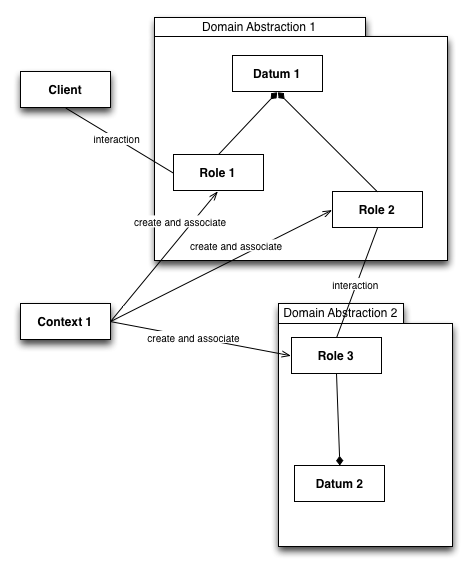 Apart from this refinement, a Datum is very close to the Model in MVC and to the Abstraction in PAC. A Role is a stateless class that cooperates with one or more Datum instances, providing the non elementary behaviour related to interactions. Referring to the previous example, a Transferable role can expose the transfer() method by making bankAccount1.withdraw() and bankAccount2.deposit() to properly cooperate. Roles are stateless since they always operate on the state provided by a Datum (by means of methods exposed by Datum, or perhaps by directly accessing its state - it's reasonable to think of a Role as a friend class to a Datum). When properly designed, Roles are pretty generic: for instance a Transferable can be applied to a BankAccount, but also to a CashAmount, or a DebitCardAccount and such. A Context is a class representing a specific algorithm, use case or user story, or even an entire application where it makes sense to associate Roles to Data. Its responsibility is to instantiate Roles, bind them to and unbind from the Datum when needed. In fact, according to DCI, Roles must not be statically associated with Data, but dynamically attached and detached in function of the need. In this way, Data are most likely to be stable and reusable in different projects, while specific Roles can be developed ad hoc. This means that we should never see code such as BankAccount implements Transferable, but rather a getTransferable() method in BankAccount (or something even better). A single Domain Abstraction is no more represented by a single class, but by a dynamic aggregate of a Datum and Roles. Datum objects never directly interact among them or with other classes, such as controllers. In other words, nothing can see a “naked” Datum: Roles act as Adapters among Datum objects and other classes. When we focus on a given context, it's quite easy to define some very meaningful and reusable set of Roles. For instance, in the UI context things such as Renderable, Clickable, ContextualMenuProvider. The fact that there are classes that are never seen “naked”, but accessed by means of adapters, should remind you of something I've written in the previous paragraph about the Presentation Model. Actually, we can think that if we're able to provide a set of UI-related Roles, properly designed so they are not technology-dependent, we can integrate PAC, Presentation Model and DCI so the Presentation Model just becomes a container of DCI Roles. In this perspective, the PAC Control is also a DCI Context which, knowing both the DCI Datum and the PAC Presentation, creates a Presentation Model with the Roles required for the interaction with the UI. Being the new Presentation Model just a dynamic container of Roles, it's possible to think of a universal Presentation Model for any kind of Abstraction. Note that the Abstraction itself can be designed according to DCI (i.e. it could be already an aggregate of a Datum and Roles) or not. In the latter case, the Control would always create the Roles from scratch; in the former case, it could reuse some existing Role already present in the Domain Abstraction. I think that there are advantages in using DCI also for the Abstractions an application, but this is not a requirement. In other words, if you already have a back-end design not made with DCI, you can safely introduce DCI only for the Presentation and Control. This Presentation Model would allow to dynamically add, remove or replace Roles according to the needs of the specific Context, furthermore without having to rely on a closed set of predefined Roles. I've been using these patterns together with success for a few years now in various projects using Swing + NetBeans Platform, Vaadin and Android. In this post I've kept code samples at a minimum in order to focus more on concepts and UML diagrams. Full examples of working Java code will be the focus of further posts.